This October will see cadets from all around Australia descend on Canberra as they take part in the Australian Air League’s 80th Anniversary Review. 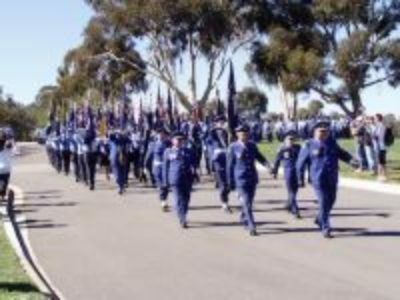 Beginning on Saturday 4th October, the cadets will converge on the new Gungahlin Oval on Crinigan Circle and Warwick Street, Gungahlin where they will take part in a day of competition in a spirit of fun, goodwill and comradeship. Cadets have been preparing all year and will be keenly competing to find which units, or “Squadrons” from around Australia are the champions in areas such as precision marching, physical activities, marching bands and education displays. The day will conclude with a March Past where cadets from around Australia will parade before the Reviewing Officer, The Honourable Sir Peter Cosgrove, AK MC (Retd), Governor General of the Commonwealth of Australia followed by presentation of awards from the days competitions. Following this, the Australian Air League will take part in Wreath Laying Ceremony on Sunday morning, 5th October at the Australian War Memorial. Cadets will form up in the Commemorative Area of the Memorial alongside the Eternal Flame, whilst the 2014 Australian Cadets of the Year will lay a wreath in the Hall of Memory at the Tomb of the Unknown Soldier. At the conclusion of this moving Ceremony the Cadets will have the opportunity to inspect the various displays in the Memorial – the Aircraft Hall and displays in the ANZAC Hall sure to be popular with the aviation enthusiasts amongst them. With Squadrons in most States of Australia, the Air League has been serving the community in Australia since 1934. It is entirely self-funding and is staffed by volunteers who give their time to achieve its goals.